Online-Sweepstakes is one of the largest directories on the web for viewing sweepstakes from a huge variety of blogs and brands. The easy submission of giveaways combined with the simplicity and age of the site has made it somewhat of a behemoth in terms of sweepstakes directories. One convenient filter that Online Sweepstakes contains is the ability to view sweepstakes by the day that they are published (going back one week from today) or those that are expiring soon (going forward one week from today). There is also the ability to visitors to the site to purchase a premium membership. 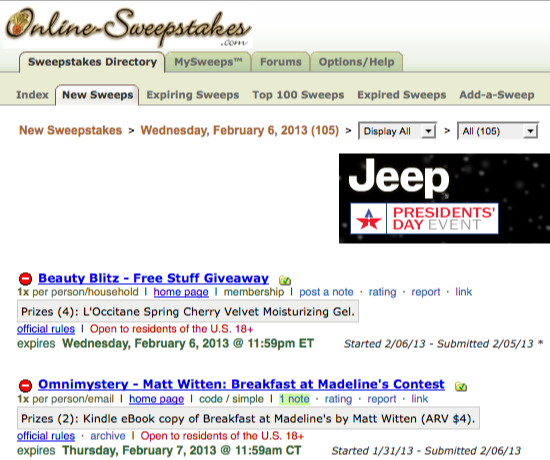 The editors of the website categorize some sweepstakes as ‘most winnable’ or prizes that are most valuable. Only premium members are able to access these sweepstakes. When the site was checked for this article there were 6,544 Current Sweeps (available to all visitors) and 2,897 Premium Sweeps which are available only to premium members. The sign up process for Online Sweepstakes does take a couple of minutes, including the wait for your confirmation email which you requires that you click a link to activate your account. Because of the many variants and categorizations of sweepstakes on the website there are also a decent number of fields that are required to be filled out before your sweepstakes is submitted to the directory. The format and design of the site is not the most sophisticated or well laid out, but it serves it purpose of simply listing all of the giveaways and sweepstakes that the directory contains. The directory also takes the liberty of categorizing sweepstakes that are submitted into prize categories such as big prizes, lots of prizes, unique prizes, and small prizes. More information about Sweepstakes directories.